THE DAVID VANDYKE RACING SEASON: OCT 16 – OCT 31. THE DAVID VANDYKE RACING SEASON: OCT 16 – OCT 31, 2018. The stable sent out eight runners in the second half of October and came back with a score of two wins and four third placings. Champagne Daisy landed her Maiden victory at her fourth race start in what was her second start of her second preparation. Previously she had raced twice as a two-year-old with the runs spaced a month apart. 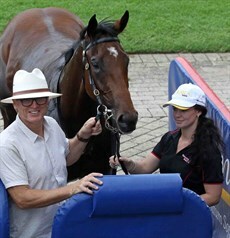 She finished third on her debut over 1100m on May 9, when beaten by 4.25, after being run down over the final 200m in heavy going, and then she showed due improvement when finishing a much closer runner-up, just a length off the winner over 1200m in good going on June 6. After that run Champagne Daisy was sent to the paddock. Three months later she won a trial over 850m on September 18. Ten days after that she was back in competitive action at Ipswich over 1100m where she had to settle for fourth place just under two lengths behind the winner. Again, the stable opted for a month between that first-up run and Champagne Daisy’s next assignment. This time, on October 21 on her home track at the Sunshine Coast stepping up in distance to 1350m, Champagne Daisy was not going to be denied with the Maiden victory being achieved by an impressive five length margin. The stable’s next winner also shed her Maiden ticket. 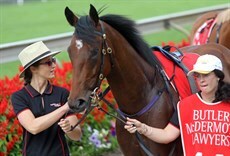 Frangipani Moon had won two trials before making her debut over 1100m at Ipswich on August 29. She had to settle for second best that day, 1.75 lengths behind Invigorating. Both of these runners would go on to frank the form of this race with Invigorating winning again, this time in town, in her next start and Frangipani Moon making no mistake in a Maiden contest over 1200m at Ipswich on October 24. Three months down and the stable continues to rake in good results. In the first three months of the season the David Vandyke stable has saluted in fifteen races won by ten individual runners from Maiden winners to running a place in a Group 1. It is always a work in progress but, as far as it goes, that has to be a very satisfying achievement. 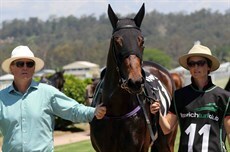 Oct 21: Sunshine Coast - Maiden - 1300m. 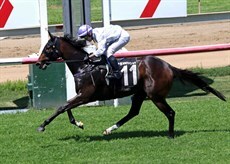 Oct 24: Ipswich - Maiden - 1200m. Champagne Daisy simply could not have jumped better from the barriers with Lloyd pushing her into a clear lead from the very first stride. Not only did she dictate the race through her healthy early advantage but she did so with a strong, confident stride which quickly had her fourteen rivals well and truly spread out behind her. In fact, Miss Melrae, who stuck closely to the leader in second place, was the only runner to stay within three lengths of Champagne Daisy all the way until the field straightened for home. It then quickly became apparent that the question was not whether Champagne Daisy would win, but rather it was how far she would win by. Approaching the 300m mark Champagne Daisy was four lengths clear and widening that margin as Jeff Lloyd took a look to his left and then his right to confirm that no challenger was in sight. The commentator’s call summed the late action perfectly … ‘Look at this go. Champagne Daisy … fair dinkum … she’s got her ears pricked at the furlong, she is five lengths in front. This was going to canter in a long way from home. Champagne Daisy waltzes in.’ Enough said! Frangipani Moon jumped well and, after disputing the early lead with Heavenly Archer, settled in a close-up second placing holding the rail position. The leader was only there courtesy of a patient ride by Lloyd on Frangipani Moon but that position was short-lived as Lloyd gave Frangipani Moon more rein a long way out and the three-year-old filly quickly moved to the front of affairs and looked to be well in command of proceedings as she cornered for home. That impression proved to be spot on as Frangipani Moon never came under any threat in the home straight allowing Lloyd the luxury of not having to push his mount out in the closing stages.